In golf, speed equates with power – literally, as a fast swing has a tendency to deliver more power to the golf ball than a slow one. However, in order to enjoy a truly great game of golf, you also need to improve your control of the swing. 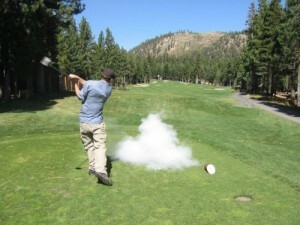 Image Credit: Exploding golf ball, A man has just hit a joke golf ball, which has “exploded”, leaving a cloud of smoke. 300×225. Kevin Stanchfield, Wikimedia Commons. 1. Core strength is so important to golf that you cannot possibly flourish in this sport without working out your core muscles regularly. If you continue playing golf regularly without improving the general strength and flexibility of your core muscles, you will feel sore and fatigued after each game. Your balance and speed will also be affected because most of your explosive energy comes from your core muscles. Whenever you turn your body to the right or left, you are actually storing explosive swinging energy (e.g. “coiling energy”). Your core muscles are doing all the work whenever you turn your body to take a shot. You can improve your core strength at home, by performing plank exercises. Planks are really easy to perform. Get a yoga mat and get into a push up position. Slowly lower your arms so that your forearm is parallel to the floor and your elbow becomes a second support point for your upper body. This is a timed exercise so try to hold this position for twenty to thirty seconds. Repeat the exercise four to five times. 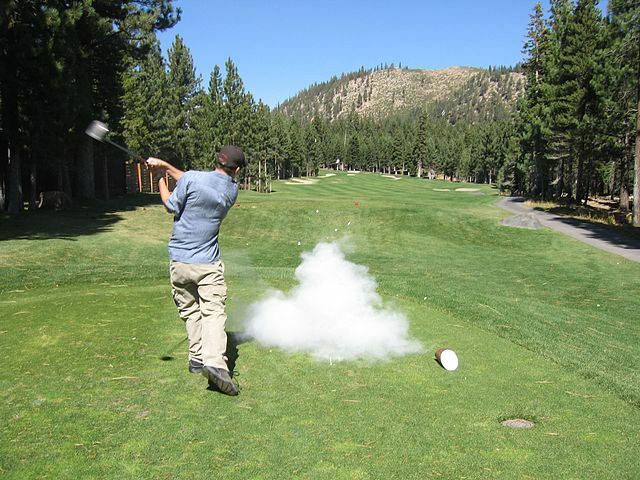 Image Credit: Exploding golf ball, A man has just hit a joke golf ball, which has “exploded”, leaving a cloud of smoke. 640×480. Kevin Stanchfield, Wikimedia Commons. If you want your core workout to be more challenging, shift to one side and let one arm support your weight. Keep your legs straight as your other hand lifts a small dumbbell upward. The extra movement (the slow lifting of the dumbbell) will challenge your core muscles even more. Another amazing core exercise that you can try is called “Turkish get-ups”. You will need a yoga mat and a small dumbbell for this exercise. Sit on the yoga mat with one arm raised over your head. Slowly stand up, keeping your eye on the weight raised above your head. Follow the same route that you took when going down to the mat again. Repeat the movement with your other arm. The ideal repetitions for this exercise are 20 repetitions minimum. 2. Leveraging is another golfing skill that you should master if you want to gain control of your swings. There are two drills that can help improve your leverage. The first one is a standing drill that requires five progressively heavy golf clubs. Pick five clubs (each one larger and heavier than the last) and swing in each in succession as fast as you can. Aim for five swings each time. The second drill is essentially the same movement with the same set of clubs but this time, you are going to perform the swings on your knees. More INFO: The Golf Swing, Beginner Golf Swing, Golf Swing Fundamentals, Perfect Golf Swing, Perfect Golf Swing Driver << HERE! Link to this article by using the following URL: http://uniqsource.com/leisure/golf-swing-speed/ COPY and PASTE! Images License: Creative Commons CC Attribution 2.0 Generic (CC BY 2.0). What is the Best Golf Swing Technique? – Find Out!